Dawson Taylor's New and Innovative Delivery Service! With a variety of bike-friendly businesses, Boise is one of the greatest cities to bike in. With easy access from the Boise Greenbelt to downtown, the city has such a large diversity of bicyclist commuting to and from work. But what about biking for work? 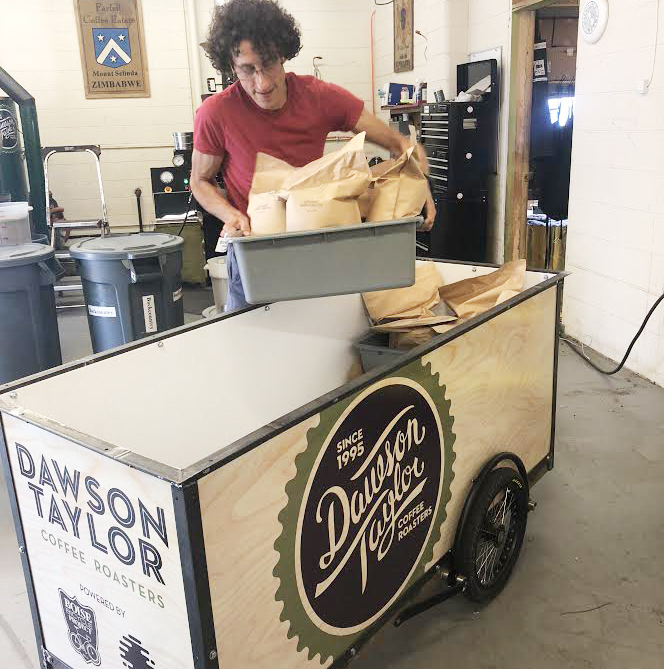 Dawson Taylor Coffee Roasters implemented a coffee delivery system for their downtown orders on their new bicycle cargo trailer. The staff at Dawson Taylor said that the delivery system is a practical way for them to deliver their coffee. Dawson Taylor received the Silver Certification is awarded from the League of American Bicyclists for being a bike friendly workplace. Since doing the unique delivery system, Dawson Taylor has noticed how fun, convenient, environmentally conscious, and fast it has been to deliver. Driving a delivery truck takes a lot longer because of the need to find parking and deal with the busy downtown traffic. When biking you can bypass traffic in the bike lanes. Bikes are also a lot easier to find parking for, after all, you can basically park a bike anywhere. The delivery system is also a lot cheaper than driving a delivery truck. Think about the cost associated with managing delivery trucks; maintenance fees, repairs, and gas. Cycling is just great for your health, and reduces the stress levels from dealing with traffic. Overall it was just a smart direction for the company. Dawson Taylor’s Roastery is right next to The Boise Bicycle Project (BBP), so it made sense for them to walk next door and ask for help. BBP acted quickly and had the bike trailer ordered the same day they discussed the project. When the trailer arrived, Dawson Taylor asked One Stone, a student-let and -directed nonprofit that empowers high school students to learn and practice 21st century skills through experiential services, innovative initiatives, social entrepreneurship, and the radical reinvention of learn, to tackle the frame part of the trailer. The students learned how to weld, cut steel, and attached the frame to the trailer. After everything was built, Signs Ink printed the side panels and attached it to the trailer just in time for its debut at the Boise Co-op’s Bike to work event. When Dawson Taylor arrived at the Boise Co-op for the Bicycle Commuter Breakfast Event , everyone was impressed by how smart and innovative the system was. The coffee delivery bike promotes a more sustainable way to deliver goods offsetting the carbon footprint emissions from trucks that requires fuel. The Boise Co-op supports the delivery system 100%, and hopes that this promotes other businesses in the area to implement the same type of delivery system. The cargo bike has had great reviews from the city of Boise, and people have been calling it the “smile machine” when they see Dawson Taylor zipping by.